This is not a post about questions by students, but about something which they might be interested in. 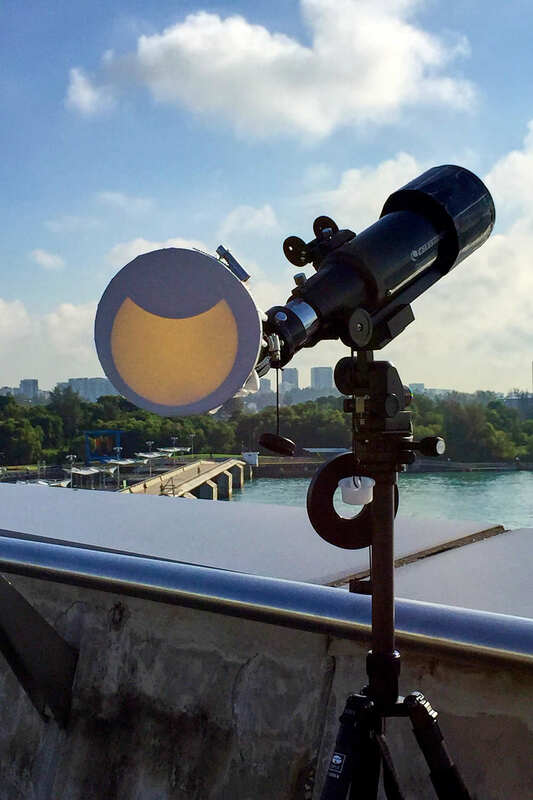 The solar eclipse occurred on 9th March 2016 and I was lucky enough to be able to view it from Marina Barrage with my significant other, Meng Choo. The weather in the morning was good and there were a few clouds obstructing the view of the sun only occasionally during the entire 2 hour period of the eclipse. In addition, since the eclipse occurred in the morning, it was much cooler. I used a Celestron Travelscope 70 and a sun funnel to project the image of the sun onto a screen. This set-up uses a series of lenses to project an image on the screen and causes the image of the sun to be inverted on the screen. There was also the hassle of constantly adjusting the telescope to track the sun as it moved across the sky. I might consider getting a tracking mount in the future. The barrage was not particularly crowded. There were some people at the barrage, and almost everyone could have a view of the eclipse on the sun funnel. 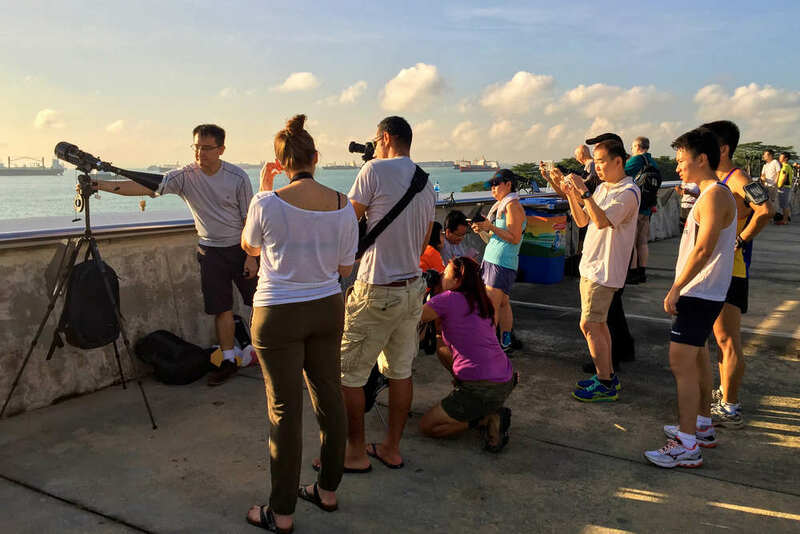 While most brought out their camera, it was not easy to take pictures of the sun as the sun was extremely bright and caused the moon to be washed out. However, viewing through solar eclipse glasses made the progress of the eclipse clearly visible. I would recommend that everyone viewing solar eclipses to always bring a pair. The difference between viewing the sun through a camera and through the glasses is a very dramatic difference. The compiled photo of the projected image on the sun funnel is shown below. The eclipse started at around 7.20am, reached its peak at 8.24am and ended around 9.30am. The images have been flipped to show the correct orientation of the sun. 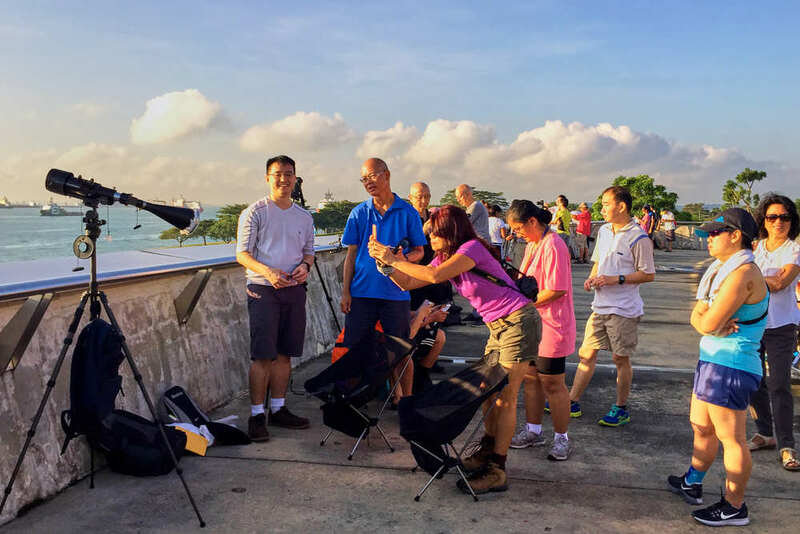 The next solar eclipse visible in Singapore will be on Dec 26 2019 around 1230pm. 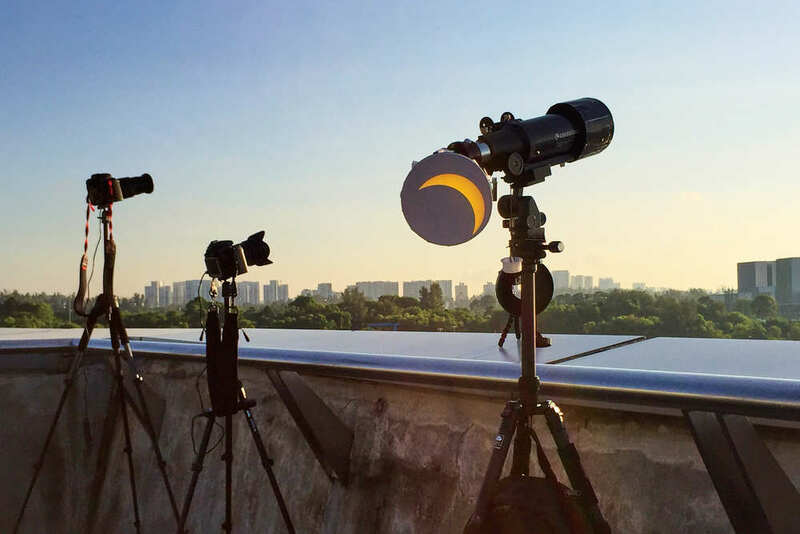 Since the sun will almost be directly overhead, it should be visible from any open space in Singapore. One thing to make sure is to order a pair solar eclipse glasses a few months ahead of time! Below is a gallery of photos taken during the solar eclipse. A big thanks goes out to Meng Choo for taking most of the pictures. Click on images for a larger version. Please contact me if you would like any of the full-res jpegs for non-commercial use.